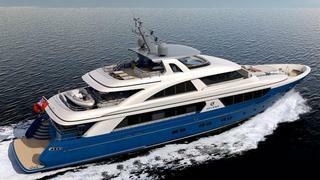 China's Jet Tern Marine is working with naval architect Guido de Groot to develop a new model in the Selene motor yacht range - the 39m motor yacht Selene 128. With design elements taken from the Selene 92 currently under construction, this will be a full displacement superyacht built in GRP and capable of world-wide cruising. To be built to ABS class and MCA compliant, she will have two VIP staterooms and two guest cabins on the lower deck - all ensuite, plus berths for 10 crew. The owner's cabin is full beam on the main deck with large windows offering great views over the water.